Your grandmother lives in the village of Gilford eh? I grew up there - tiny place that very few people know of. Small World! She actually died earlier this year, but yes.... she lived in Gilford for many, many years. She's now buried in Bradford. I'm a huge fan of Healey's music. Its a crime that he isn't on the Canadian Walk of Fame (don't believe me, ask Danko Jones his thoughts on the topic). Anyway, I always found it a little amusing he had songs called See The Light and Angel Eyes. 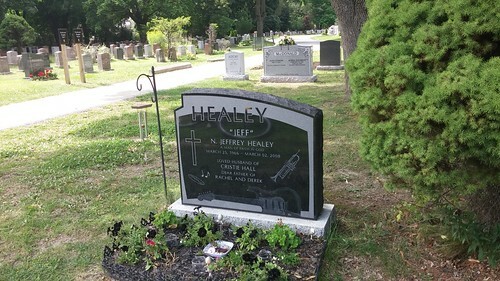 Jeff Healey isn't on the Walk of Fame? That's an atrocity that needs to be rectified! Mike, since he's related to you, I expect you to head up the campaign. I remember when I first heard Confidence Man on Q107. I went out and bought the cassette. 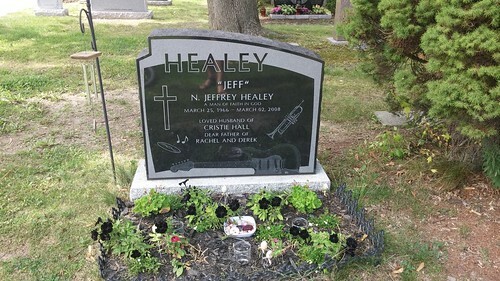 I don't have any of Jeff Healey's music, but I went to school with Jeff Healey. He was a few grades behind me, but we were on the bus to school together and he played his guitar and sang, but he sang country songs which was nice. Too bad he's gone now. This is why Cheryl would make a great guest on your show. I don't know what the Walk of Fame is but if it recognizes great musicians then Jeff Healy should be on it. Well, I don't know if I want to be on your show or not. I don't know what I have to do to be on it. I could be asked, but I could say no if it's too much. You never know. Of course if I get paid for it, I would make a better effort, but I'm not going to say yes yet. It's true, I went to school with Jeff Healey. I met Jeff a few times in my early 20's he was a good friend of a buddy of mine. Saw him play a couple of times @ Bannisters in the Hammer. Partied with the band and played some pool with Jeff using his cane as a cue with us aiming for him. Jeff met my friend in the temagami area where he would go every year with his folks as did Jeff. Backstage @ Ontario Place was a memory not to forget! A huge talent and super person pity he is not recognized as he should be. I would be happy to donate my podcast salary to Cheryl so she could appear. @Mike - Your story sounds familiar. My mother once explained how I am related to the Bachman family, that of Randy, Robbie and Tim, on the Dobrinsky (Ukrainian) side. By blood, at least, I am 100% Ukrainian. The only Ukrainian that I know, though, has to do with food. No surprise there. Never having been one to understand the fringes of genealogy, I think "removed" is the most applicable word for whatever familial link there is to the Bachman family. Coincidentally, Bachman-Turner Overdrive on the 1974 Not Fragile tour at Winnipeg Arena was my first ever concert, so I never quite felt that my parents were not "cool". Now I'm going to go nominate Jeff Healey. Thanks for the link, Al. I saw that on their site and yes, I'm going to nominate him. It was actually @Corey who supplied the link, but either way I like that we're starting a campaign right here on Toronto Mike! Let's get Jeff Healey the star that he deserves on Canada's Walk Of Fame! Jeff Healey should have a star on Canada's Walk of Fame. Something so very likeable about him. Glad that Cheryl got to hear the young Jeff strumming away. That wind chime is a nice touch. Well, what do I have to do? I may need money to pay for my cab fare to get to the place you do your shows. Anyway, I didn't know Jeff that well, but he was on the bus every Sunday going to school and every Friday going home. He was still there when I left the school. Correction Notice - Yes, it was Corey who provided the link. I saw Al's name right by the link and typed away. I think this morning's coffee must have been defective. Thanks for the link, Corey. Jeff Healey definitely belongs on Canada's Walk of Fame. He qualified under several of their criteria. I wrote this about Jeff Healey's Canadian Walk of Fame snub in 2011. Still not over his death. Loved his music and his guitar playing was top notch. Mike, I read that Jeff was adopted. Would your relation be to his birth parents or the Healeys? Please correct me if I am mistaken. I've done my part and nominated Jeff as well. I can't help but think of Jeff's role in the Patrick Swayze movie "Road House". One of those movies that is so bad that it is good. Submitted also, his version of While my Guitar gently weeps, is equal to George Harrison's in my opinion. I don't know about equal but it is a damn good version of it and I had forgotten he did it. The one problem with the Canadian Walk of Fame is that they only add one deceased member a year. I'm sure they don't want to celebrate too many dead people, but it seems pretty short sighted to limit that to 1 person. So the problem is, as long as someone 'more famous' than Jeff dies every year, he'll keep getting bumped. @TorontoMike is it also true you are somehow related to Bono of U2? If so, will you form a band and launch your own singing career? Jeff Healey is finally going to be inducted to Canada's Walk Of Fame! I wonder how much the commenters on this site had to do with it. I let Jeff know via his managment that his music was being stole from an ugly band in argentina called LOS GUARROS, they use to label Jeff music as if they were the music and song writters.